This book includes comprehensive landscape photography instruction. The following are sample paragraphs from only a few of the topics discussed. Dynamic range is the range of light intensities that can be viewed/captured from very dark to very bright while still maintaining detail in both the very dark and very bright; defined as the number of stops from detail less white to blocked up black. It is important to note that our eyes can perceive about 12 stops of light without adjusting the pupil. In situations where our pupils open and close for varying light, our eyes can perceive about 24 stops. At the time of writing, most DSLRs capture about 5 to 7 stops of light in any given scene. This explains, why, even though we can see detail in the highlight area of a scene with our eyes, what often records on the sensor is blown out; over-exposed. Or, why, even though we can see detail in the shadow areas of a scene with our eyes, what often records on the sensor is blocked up; under-exposed. Often the contrast of a given scene may well exceed the range of the sensor's ability to record it. What is a stop of light? It is the amount of light required to either increase by double, or decrease by half the current amount of light. To gain or go up two stops of light is to receive four times more light than one started with. Conversely, to lose or stop down two stops of light is to receive four times less light than one started with. Think of it this way, if a room is lit by two 100w bulbs one can make it one stop brighter by adding two more 100w bulbs to the room. Conversely, if one starts with a room lit by two 100w bulbs and one bulb is removed, the room becomes one stop darker. Often photographers will use the terms "opening up" and "stopping down". Opening up refers to letting in more light, stopping down refers to letting in less light. In photography, an exposure occurs when we allow light to pass into our light tight boxes and record on a medium. In the film days, if we inadvertently opened the back of our camera while it was loaded with film, an exposure occurred, not a good one, but an exposure nonetheless. More accurately for our purposes, exposure is the total amount of light allowed to fall on the sensor during the process of taking a photograph. Only three camera settings affect exposure, they are ISO, Aperture and Shutter Speed. That is it! With all of the fancy buttons, dials and menu settings available on today's cameras, I hope it is comforting to know, the exposure is determined by only three. Cameras can make the wrong exposure decision for a scene. Yes, it's true! Camera meters can be fooled because of the way they are designed to function. They sample the light in the viewfinder and no matter how bright or dark the scene is, they adjust the aperture and/or shutter speed so that the light exposes as a medium tone. This means bright, white snow (light tone) is darkened to gray, drab snow (medium tone); and a black bear (dark tone) filling most of the frame will be lightened to a grayish, medium tone. That's how it works - it's that simple. When shooting a medium tone scene such as a green forest, grass, gray tree bark, etc., then the camera's metering system in auto mode will set the aperture and shutter speed for a proper exposure. Manufacturers design their metering systems this way because they want the majority of photographs taken with their cameras to be acceptable. Since most photographs are taken of medium tone subjects, the majority are acceptable. Knowing how to set up a camera for landscape photography has become far more daunting in the digital age. There are so many settings and choices, it's easy to feel overwhelmed. In this section I address a few of the most important settings, based on the idea that the camera will be used to shoot landscape photographs from a sturdy tripod. The settings I give are the ones I use, that does not make them right or wrong, they are simply the settings I like for my workflow. What does a great outdoor photograph have that snapshots do not? Superb composition! It is an image that catches the eye of the viewer and evokes an emotional response, preferably the one intended by the photographer. There is a huge difference between taking snapshots and photographs. When taking snapshots, we tend not to scrutinize subject placement or evaluate complementing or distracting elements. Yet when taking photographs, we pay careful attention to every aspect of the composition. In photography, composition is the arrangement of elements (mountains, streams, lakes, flowers, etc.) in the viewfinder that will create an image. The landscape photographer's goal is to make this arrangement as captivating and pleasing to the eye as possible. Composition is subjective in the choice of subject matter, lighting, location and perspective. However, there are guidelines that can lead one down the path to improved composition. The following tips will help one achieve greater success. Please note, there are exceptions to all of the following compositional tips. It is not uncommon to violate them. Great news! There's not a lot of critical equipment required for landscape photography. Besides the camera and lenses, I'd say that only two or three items are really required in the field. They are a landscape tripod, polarizer, and possibly a split-neutral density filter. The bad news is, with the advent of digital cameras, roughly 50% of the process to create a fine landscape photograph is field work, the remaining 50% is post processing. This means, to consistently produce desirable landscape photographs, one also must purchase a quality digital darkroom such as Adobe Photoshop. Don't just buy one, use it! I cannot stress this enough. This is a very important piece of equipment. A tripod is a must for clear, sharp photographs. With long shutter speeds often required for landscape photography, hand holding is not an option. At practically every photography workshop I lead, participants struggle to gain familiarity with a piece of equipment they've owned, but seldom used. Oftentimes, they are using the wrong kind of tripod, resulting in broken equipment and missed opportunities as they fret with adjustments. What is a proper tripod for landscape photographers? An important feature to look for is a tripod with legs that do not attach to a center post. Many landscapes require shooting from uneven ground, hillsides and other precarious places. The most suitable tripod for these varied surfaces is one with legs that move independently and can lock in a variety of positions out to 90 degrees. One is also best served by a tripod that can be adjusted from very close to the ground to standing height without having to crank up an extension shaft. Another useful feature is a quick-release head, allowing one to quickly and simply attach the camera to the tripod. The tripod head should tilt to hold the camera in vertical format. 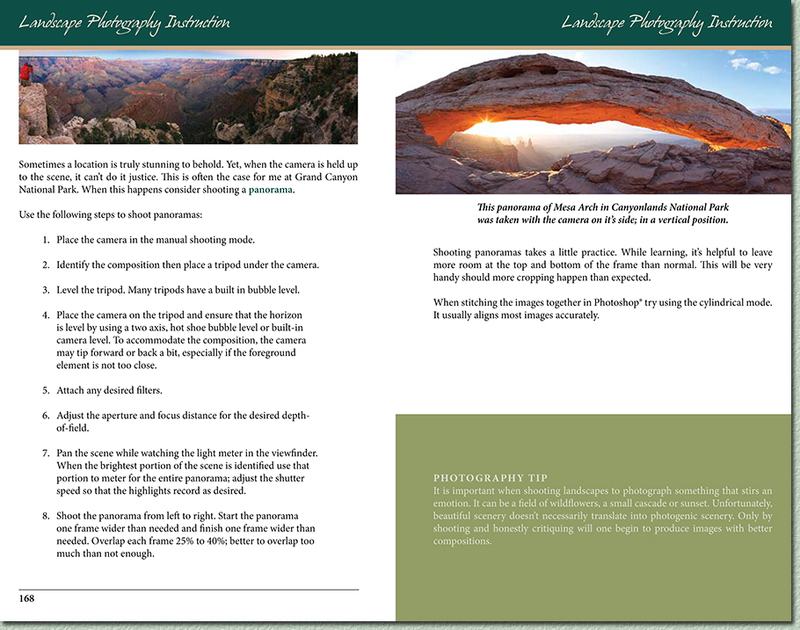 Below is pages 168 & 169 from the landscape photography instruction section of the book.